Last weekend we spent a lot of time harvesting the honey from the hives that didn’t make it through the winter. It’s sad, but needed done. It’s still so amazing how perfect those frames of honey are! 4) Start to look at how your your body mechanics affect the bees while working them. Are you frequently moving your hands across the top of the frames as you break apart the frames. Instead, use your right hand to break the entire line of bars along the right side then do the left side (with your left hand preferably). Pull the frames closest to you first so you don’t reach across any more than needed. Don’t stand in front of the hive. If possible, try working from the side of the hive instead of the back and you won’t be reaching across them as much. If you have multiple boxes and you “must” inspect to the bottom take the tower of boxes off first and inspect from the bottom, adding one box back at a time rather that stirring them up in each box as you work downward. And finally, if you have to shake bees off the inner cover, out of a box, or elsewhere, save that until last – no need to stir them up while you still have work remaining. If you have more ideas and suggestions feel free to add them below. Anthony Fettes, ASLA, PLA, SITES AP, is a Senior Landscape Architect and Ecologist at Sasaki in Watertown, MA. “The book has six chapters and covers topics like native plants, letting nature guide your garden, gardening for pollinators and birds, our relationship with wildlife and how are gardens are a meeting ground, and the life cycle of nature relating to our garden. Throughout the book are also 6 interviews with ecological gardeners who have turned their property into a ‘living landscape’. It is interesting to see how their garden transformed from its original purchased state. One lady in Florida even found a threatened native lily growing on her property after allowing her garden to become more natural. Whether you are a hobbyist, sideliner, or a commercial beekeeper, spring is a busy time for many beekeepers. Of all the spring tasks, splitting colonies may be the most crucial. Whether beekeepers split to expand their operation, to re-queen their colonies or control varroa, splitting is an important, yet time consuming task. In many ways, splitting is a right of passage for beekeepers. As with all beekeeping we have to ask ourselves what our goals are. Do we want to keep bees just to have bees? Do we want to keep them in as “natural” a way as possible? Do we want to make bees for sale as nucleus hives? Or do we want to manage our bees for honey production? If one wants to manage their bees in as natural a manner as possible then do so by following their lead. Thomas Seeley and others have determined that honey bees will choose a dry cavity approximately 40 liters in size with an entrance of approximately 2 square inches. The bees select that size because it gives them what they need to meet their ultimate goals – reproduction and survival. They build up fast, fill it, and swarm which has definite advantages for them from pest, disease, and reproduction standpoints. If we want to keep bees more naturally we simply need a gum log or empty 40 liter box with a hole bored in the side – no frames, no foundation, nor fancy hive accessories. But most of us don’t keep bees naturally. The moment we step away from that gum, skep, or single 40 liter box we are managing them in a manner to accomplish our goals not their goals. I’m not interested in raising bees in cavities like they select. I’m interested in managing bees in cavities I select based on the goals I wish to attain. But that’s not so bad. My bees benefit from disease management, protection from starvation, and pest control which they would not have if left on their own. For me that’s different management and different box configuration for making queens, a different box configuration for overwintering, and lots of boxes for honey production. And it’s also lots of management every step of the way. Adding ventilation, boxes, making early splits, treatments, IPM, regular assessments, and interventions just so I can support them while they focus their efforts on plundering the local nectar resources. Regarding upper entrances, they are added when needed for ventilation, reduce brood nest congestion, and increase traffic efficiency. They also create a disruption in the swarming process. They allow nectar to be cured quicker with less effort increasing the bees’ efficiency, decreasing their caloric expenditure, and saving precious wing wear and tear for their future as foragers. But managing upper entrances also means getting them back off when they are no longer needed which is after the nectar flow and prior to the major pest onslaught such as hive beetles and yellow jackets. For the most part it is a two month a year manipulation. It is work for me which increases the efficiency of the hive such that they can grow far beyond what nature intended. But it requires management. Beekeeping is science based management. It is not for the lazy nor for procrastinators. Most people want their beekeeping to be something in between a gum standing in the backyard and what I strive for. Most probably don’t want large hives – they want a little honey and a well pollinated garden. That’s great. For them they can choose any number of hive types such as Langstroth, TBH, Warre, Long Lang, etc. and have good outcomes while enjoying their bees. It’s all good if you know your goals and follow your ideals and science. Interesting event in the bee yard. A couple weeks ago I performed a cut out on a top bar hive that had gone burr comb crazy. I cut and rubber banded brood into deep Langstroth frames and brought it home. After letting them settle down I inspected the hive and was pleasantly surprised to find the queen unharmed. She was nice and big and had a dark color. Happy with myself, I closed them up. I did note that they seemed less than industrious and after over a week they took littl…e sugar syrup and other than attaching the old brood comb to the frames they were not building new comb. There were plenty of loafers around the front while seemingly there was plenty of work to be done! Then, they were gone! Not like a swarm or a new package sometimes absconds in a few days. It had been well over a week; maybe ten days. It could be they were thinning down the queen for flight. I though to check if that fat, heavy queen had been left behind but she was gone. It also seemed they might have waited until almost all of the brood hatched out before they left. I checked all the trees because I look at all my hives daily and they had been there the day before. Nothing. Then I checked the swarm traps. Nothing. Not even scouts. I resigned myself to losing them. Then I noticed a hive I had split the week earlier. It was three doors down from the absconded colony. The split had a queen cell but I didn’t think a laying queen yet. And the split had been a weak split of just a few frames of bees. But wait. Now the split was bubbling over with bees. By now you’ve guessed it. A usurpation had occurred. Wyatt Mangum writes about this happening especially during summer when a normal swarm would have almost no chance of otherwise surviving because of dearth. Wow. Throughout history, honey always played a significant role in society. In the old Pagan world, it was believed that honey was a direct link to the Gods themselves. In ancient Rome, it was a status symbol and those who produced the finest, sweetest honey were considered to be esteemed, prestigious citizens. Later in the middle ages, thanks to the ancient Greek medicine men, honey was associated with medicine and was viewed as a form of remedy for several alignments and thus, it was used by pharmacists (back then, known as Apothecary) and even Alchemists for medicinal purposes to heal the sick. Though I say it myself I am usually pretty good at finding queens. Obviously this is in a beekeeping context, I don’t roam the streets looking out for flamboyant blokes with a touch of the Quentin Crisp! In my beekeeping career I must have found thousands of queens during hive inspections, searching nucs and mini nucs and also in swarms. Sometimes it can be like looking for a moving needle in a moving haystack but there are things you can do to help yourself. Looks like I get to cross another one off my beekeeping bucket list. Comb honey! When I started beekeeping I read Richard Taylor’s book, The Joys of Beekeeping and have had the idea of making comb honey ever since. I crowded this hive after the first month of the flow by removing a super when they actually needed one, and replaced it with a super of Ross Rounds. Now, about three weeks later, all 32 rounds are beautifully capped. I realized after pulling it today that I had no space in the freezer so I put it back on top after inserting a medium. They deserve the space for all their hard work! Currently when foragers return at the end of the day it looks like a package of bees hanging from each entrance. In March, 2018 David MacFawn, Fleming Mattox and Dave Schuetrum began an effort to explore wild bees in Congaree National Park (CONG, https://www.nps.gov/cong), which is just southeast of Columbia, South Carolina (Figure 1). We are interested determining the size and health of the feral honey bee population there. Various staff and visitors have reported a few others over the years, and we recently found one wild “bee tree” in the park, which was located quite far from any trail. Much of the park is a vast wilderness area, however, and researchers have not systematically searched for bees before. The first phase of our project, (hopefully with follow-on studies), to determine if honey bees are surviving in the forest. The second phase is to study how they are dealing pests and diseases (e.g., Seeley, T.D., et.al. 2015; Seely, T. August, 2017; Tarpy, D.R., Delaney, D.A., Seeley, T.D. 2015). The bee population in the United States has been declining over the past few decades (Figure 2, vanEngelsdorp and Meixner, 2010). Scientists are studying several possible factors that impact the bee population including habitat, genetics, disease, and pesticides. Bee keepers are actively managing their apiaries to treat for diseases in order to improve survivability. Beekeepers also provide hives for the bees to live in, selectively breed the bees, treat for diseases, and work to keep the bees away from chemicals and pesticides (Graham, J. M., editor. 2015). According to the park’s Foundation Document (NPS, 2014), which summarizes the park’s key legislation and priorities, the mission of Congaree National Park is to protect, study, and interpret “the resources, history, stories, and wilderness character of the nation’s largest remaining tract of southern old-growth bottomland forest.” The park was preserved as Congaree Swamp National Monument in 1976 after grassroots campaign, and re-designated in 2003 as a national park. The park’s 26,000+ acres include 11,000 acres of old-growth, which bear no ecological or historical evidence of being clearcut (and certainly not in the last several hundred years) as well as >15,000 acres of wilderness area protected by the Wilderness Act of 1964. The wilderness designation is relatively rare in the eastern United States and sets a high priority for keeping the area “untrammeled;” more information on the Wilderness Act and land management is available on the web at https://www.wilderness.net. Furthermore, the park does not apply insecticides in the forest. CONG is also home to the NPS Old-Growth Bottomland Forest Research and Education Center, which works to connect scientists to parks and people with park science. Because of its protected status, CONG offers a unique opportunity to study wild bees in a floodplain forest where nature is generally left alone to develop naturally. Studies in other natural areas have documented wild colonies with an average density of 2.5 colonies per square mile (Seeley, T.D., et.al. 2015; Seely, T. August, 2017; Tarpy, D.R., Delaney, D.A., Seeley, T.D. 2015). 1) What is the bee density within the park? 2) What is the bee distribution within the park? 3) Are the bees within the park genetically different from bees outside the park? 4) How are the bees surviving without active management? 5) Are pesticides a problem within the comb of the hive? 6) What is the bee pollen source and is this different from bees outside the park? The purpose of our study is to begin to answer these questions in a logical and organized manner. The first part is to attempt to determine bee density within the park and to see if there is genetic uniqueness to this species. The first part of the study in 2018 is to capture bees both within the park and in adjacent areas. Bees will be lured using sugar syrup laced with a natural pheromone, anise oil. Approximately 12 captured bees per lure will be sent to the University of Delaware for genetic analysis. Since hives normally have 15,000-60,000 bees, the removal of several dozen bees will have no impact on hive survival. If phase 1 documents abundant, genetically distinct wild bees in the park, then a second phase of the project will seek to locate the colonies and possibly sample comb for chemical analysis to determine pesticide loads. Colonies will also be monitored to determine health and survivorship. The project is currently being funded through the generosity of Mid-State Beekeepers’ Association and the South Carolina State Beekeepers’ Association. Through local beekeeping associations we are seeking volunteers that may be interested in volunteering to assist with this project. Sampling (Figure 3) will take place over 1-2 weeks in June. The sampling will involve three day trips to the sites, including one day to deploy the lures, one day to check (and hopefully refill) them, and one day to sample. Volunteers do not have to commit to all three sampling days. Some sites are more remote than others, and volunteers should have a range of options in terms of physical challenge and difficulty. Boardwalk (2.4 Miles) – The boardwalk begins on a bluﬀ at the Harry Hampton Visitor Center with an elevated section that leads down into the old-growth bottomland hardwood forest. A variety of diﬀerent tree species can be observed including bald cypress and tupelo trees in the lowest elevations. Loblolly pines, oaks, holly trees and maples can also be observed. The boardwalk has benches along the way and is wheelchair and stroller accessible. Bluﬀ Trail #1 (1.7 Miles) – This upland trail loops north of the visitor center and connects to the elevated boardwalk for a short distance. The Bluﬀ Trail passes through a young forest of loblolly and longleaf pines. Evidence of prescribed ﬁres can be found along the Bluﬀ Trail. Sims Trail #2 (3 Miles) – The Sims trail, an old gravel road, runs from the Bluﬀ Trail on its northern end to Cedar Creek on its southern end, crossing the boardwalk twice. The clearing at the intersection with the Weston Lake Loop Trail was once the site of a hunt club where Harry Hampton was a member. Weston Lake Loop Trail #3 (4.4 Miles) – This loop provides great views of Cedar Creek where otters and wading birds may be observed. The eastern portion of the trail follows a cypress-tupelo slough (dried-up river bed) where many cypress knees can be seen sticking out of water. Oakridge Trail #4 (6.6 Miles) – Passing through a rich stretch of old-growth forest, the Oakridge Trail traverses a subtle ridge where a variety of large oaks grow. The number of low-lying sloughs (dried-up river beds) makes this trail great for viewing wildlife. River Trail #5 (10.0 Miles) – This trail leads to the Congaree River, the lifeblood of the park’s great natural diversity. Approximately ten times a year, the river overﬂows its banks and pulses water throughout the bottomland forest. When the river is low, a large sandbar may be visible. Much of the forest along the river was logged prior to the park’s establishment and vegetation here is notably denser than that of other trails. Kingsnake Trail #6 (11.7 Miles) – The Kingsnake trail, which is not a loop, is a favorite trail for birders because of the diverse vegetation and proximity to Cedar Creek. When the sloughs (dried-up river beds) are full of water, beautiful views are around every bend. Bates Ferry Trail #7 (2 miles) – Starting from Route 601, this trail follows a 1920’s ferry road south to the Congaree. It is a remnant of the area’s rich history, which includes colonial-era ferries that once crossed near here. While at the river, please be aware that the bank is steep and could potentially be slippery. It is best to stay on the marked path, as old side trails are unmarked and not maintained. Longleaf Trail #8 (.6 miles) – This trail branches oﬀ the Bluﬀ trail, providing access to the Longleaf Campground. Graham, J. M., editor. 2015. 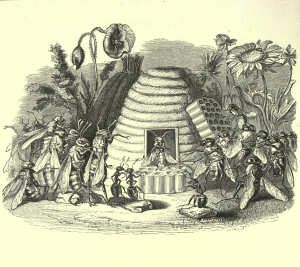 The Hive and the Honey Bee: A New Book on Beekeeping which Continues the Tradition of Langstroth on the Hive and the Honeybee. Dadant & Sons, Hamilton, IL. 1057 pages ISBN 978-0-915698-16-5. NPS, 2014. Foundation Document: Congaree National Park, South Carolina. U.S. Department of the Interior, Washington, D.C., 76 pp. Accessed May 7, 2018, from https://www.nps.gov/cong/learn/management/upload/CONG_FD_SP.pdf. Seeley, T.D., Tarpy, D.R., Griffin, S.R., Carcione, A., Delaney, D.A. 2015. A survivor population of wild colonies of European honeybees in the northeastern United States: investigating its genetic structure. Apidologie (Springer Verlag) v. 46, no. 5, p. 654-666. Seely, T. August, 2017. Honey Bee Environment of Evolutionary Adaptness (EEA). Presentation To Eastern Apiculture Society, July/August, 2017 conference, Newark, Delaware. Tarpy, D.R., Delaney, D.A., Seeley, T.D. 2015. Mating Frequencies of Honey Bee Queens (Apis mellifera L.) in a Population of Feral Colonies in the Northeastern United States. PLoS ONE, v. 10, no. 3, 12 pp. doi:10.1371/journal.pone.0118734, accessed May 7, 2018 from http://journals.plos.org/plosone/article?id=10.1371/journal.pone.0118734. vanEngelsdorp, D., Meixner, M.D. 2010. A historical review of managed honey bee populations in Europe and the United States and the factors that may affect them. Journal of Invertebrate Pathology, v. 103, p. S80-S85, doi: 10.1016/j.jip.2009.06.011, accessed May 15, 2018 from http://ento.psu.edu/publications/van-mex-2010. It’s 97 degrees in South Carolina and today’s date is May 13th. I’ll bet that most of you reading this have already flipped that switch on your central air unit from Heat to AC. Well, the bees do the same thing – almost. They switch from keeping the brood warm to keeping it cool. And the way they do it is fascinating! And you can participate too! Honey bees have a knack for maintaining the internal temperature of the hive at around 93 to 95 degrees Farenheit. They do this primarily because this is the ideal temperature for their brood. How they do it is remarkable. Watch them on the landing board fanning. Some hang upside down on the lip of the brood box, others stand on the landing board. Sometimes you may even notice that bees on one side of the landing board are facing towards the box and on the other side of the landing board they are facing away – just to create a flow of air through the hive. Inside they are also busy fanning creating currents of air to keep the temperature correct and also to evaporate the nectar into honey. Standing outside your hive you can hear them inside buzzing like a motor or fan running. In the heat of the summer it gets to be a big job for them to maintain the correct temperature inside. The lack of watery nectar further reduces the effects of evaporative cooling so the bees gather water and return to the hive placing droplets of water inside thus reducing the temperatures via its evaporation. This also helps maintain the correct humidity for the brood. Yet another method they employ is to gather outside to reduce the internal heat. We call this bearding. While cold blooded, the heat generated by the muscle activity of tens of thousands of bees heats up the interior of the hive. It makes good sense to reduce the number of bees inside. What can you do to help them maintain the correct temperature of the hive? Depending on the configuration of your equipment you may be able to help. One of the simpliest methods is to simply place a popsicle stick under the corners of the outer cover allowing the heat to escape. I have a few migratory covers this year and will be slipping popsicle sticks between them and the upper most box. The thin popsicle stick, or two, is not large enough to allow robbers to invade but will allow the rising hot air to exit the hive. Screened bottom boards should be open during the hot summer. The bees inside will circulate the air inside the hive such that cooler air is pulled in and around the interior and exhausted to the outside. If your inner cover has an upper entrance keep it open to allow heat to escape. If the colony is weak a little screening across the upper entrance may be needed. With dearth many beekeepers will reinsert their entrance reducers to prevent robbing. If you have a screened bottom board this reducing of the entrance will probably be fine. If you are using a solid bottom board I recommend you leave the entrance reducer out, replacing it with #8 hardware cloth bent into a U shape and pushed into the opening (remember to leave them an entrance to come and go). The screen will allow airflow which would have otherwise been blocked. Go traditional and paint your outer cover reflective white. Why not, it’s after Easter. Place a slightly longer piece of cardboard over the hive making an awning over the front porch (assuming it’s facing south). Clean up any debris under the hive to allow air to circulate. Make a 1 1/2″ shim to go between the inner cover and outer cover and drill 1 inch ventilation holes on the sides (cover holes with hardware cloth to keep out robbers). Got more ideas? Add them below. Nectar flow is slowing. The dry spell we have had is not helping. In the Midlands, with some exceptions, sometime around the first part of June the bees will have a hard time finding enough nectar to meet day to day expenditures. New beekeepers will probably have to feed syrup. Established hives may have enough honey. Regardless, their behavior will change, robbing can become an issue, and your management will change as well. The purist in me wants to feed the bees nothing but their own honey if it is available. And I do leave them a good bit at all times. However, if you are just starting you very well may not have any options other than to feed sugar syrup to newly established hives during the dearth. Comb building will become increasingly difficult to stimulate, sometimes the bees will chew up your wax foundation rather than build, and you’ll wonder why. I’m just not sure what it is in nectar that makes the bees so happy and eager to build. But once the nectar lessens you may find yourself mixing sugar syrup. A 1:1 (by weight) solution is the preferred mix during the summer dearth. The bees won’t complain if you make it a little thinner (sugar content of nectar varies quite a bit in nature) but I keep it around 1:1. Be prepared to keep a close eye on your hives, especially if you have more than one hive, for the possibility of robbing. Entrance reducers may be needed on weaker hives to reduce the area the guard bees patrol so as to allow a defense against would be invaders. If you go into hives for inspections be mindful to not leave a honey super uncovered or unattended which could trigger a robbing frenzy. Continue to make hive inspections taking note of the hive’s development as well as pests and honey/nectar stores. Also during this time become accustomed to lifting your hive slightly from the rear to get a feel for its weight. Do this often and start comparing what you see inside to how heavy the hive feels. Eventually you will be able to feel a light hive and know when to feed. This skill will pay dividends during the winter when you won’t be opening the hives to determine adequate stores. During dearth, forager bees have less work to do. Some of the older beekeeping books speak to the bees gathering all the local nectar early in the day and then, with nothing to do, staying in, or on, the hive. The combination of older, forager bees in the hive and scarcity of available food makes for a combination that displays itself as increased defensiveness around your beehives. You will definitely start to notice that the bees seem more edgy and quicker to protect their hive. I wear my veil even when just feeding during dearth. You’ll also start to see more and more bees hanging out on the front of the hive. They display a curious dance-like behavior called washboarding. Sometimes so many bees will be on the front of your hive and landing board it may cause concern. Most of the time these behaviors are associated with increased heat in the hive or not enough space. You should know if they have enough space by your inspections. As for the heat, the bees create quite a bit of heat in the process of fanning within the hive to dry out the nectar and create honey. All that muscle activity coupled with increased outside temperatures causes the inside temperature to increase. The bees know what to do though. They gather at the entrance, line up, and start a circulatory air current to remove the heat and humidity. Clever bees! And as for those bees hanging out on the front, they are outside because it’s too hot inside and more bees inside would just make matters worse. If they look like they are hot you can help them with ventilation by placing a Popsicle stick or two between the outer cover and the inner cover. The crack will not be large enough for robbers to get in but will allow some heat to escape. Another issue, not strictly related to the dearth, will be an increase in pests. Other insects want to eat too and times are hard all over! Be on the lookout for an increase in hive beetles and later, yellow jackets. There are various means of dealing with hive beetles (SHB Handbook Here) so I won’t go into those. As for the yellow jackets that will arrive later in the summer, a strong colony will eject the occasional robber. Hive watching entertainment gets slow as the summer progresses but you’ll get some entertainment watching three or four bees drag a “wanna-be robber” yellow jacket out of the hive and toss him over the edge of the landing board! If you’d just like to trap them there are many DYI yellow jacket traps on the Internet. Make sure you use the vinegar in the recipe – I believe this may deter interest by honey bees. Enjoy some honey today in your tea or on a waffle. Just enjoy! More relaxing music for a Saturday. Indications are, we are approaching the end of the nectar flow. First it’s not really the end of the nectar flow. Rather it is a sharp decrease in nectar availability IN EXCESS of colony day to day needs. Our local www.hivetool.net monitored hive shows recent changes in the weights during the daytime nectar gathering hours. What appears now is 1) sharp decrease when foragers leave the hive 2) sharp increase in weight as they return with nectar during the first half of the da…y 3) followed by afternoon decrease when nectar becomes scarce yet evaporation of in hive nectar continues, followed by 4) sharp increase in weight at end of the day when foragers return. Finally, 5) decrease in hive weight over night as nectar is steadily evaporated into honey. Other indicators: Increase in bee irritability especially in the hot afternoon hours. Some foragers are staying inside without the strong scout signals of nectar sources. Foragers are older bees with and a bit more defensiveness as a rule. Expect a steady increase in more defensiveness as nectar flow continues to slow, especially in the afternoons. Depending on the size of your colony you may have 30,000 foragers willing to bounce you out of their hive. Besides you look like the Stay Puft Marshmallow Man anyway. Bees leave the hive each morning looking for the biggest nectar bang for their buck as indicated by the findings of the scouts. After they clean that up they will scout and find lesser sources. I have noticed honey bees in late afternoon on sparkleberry and magnolia which typically are not attractive to them in the morning hours when something better is available. The fact that they are foraging 2nd class venues is indicative of preferred nectar plants drying up early in the day. A nice evening or nigh time rain may help this. That’s my report on the Midlands as we approach the end of the flow. We really need to start prepping first year beekeepers with regard to changes in their beekeeping post nectar flow. i.e. feeding, water sources, protective equipment, mite treatment. There’s always something to do! – the quality of bending easily without breaking. Danny Cannon, our current local club President, delivered one of the best lectures I’ve ever sat through at a meeting about two years ago. It was titled “Flexibility in Beekeeping,” “Being Flexible in Beekeeping,” or some such similar title. That lecture keeps ringing through my brain lately and for good reason. While the lecture had many layers of information, one of the threads in the lecture was the idea of moving backwards, sideways, (and other dance moves) as easily as we move forwards in our management. For instance, recently I’ve been playing musical chairs with supers, frames, and bees. Let me explain. In the Spring it’s all about adding, expanding, and growth around here. Things seem to get bigger. A lot of addition taking place – boxes, hive stands, and new hives. The thinking is, If I can stay ahead of them with “more” they won’t swarm. Add, add, add. Grow, grow, grow. Feed, feed, feed. Gotta add more boxes and frames! Look and act – usually with more, more, more. Find a swarm and be flexible enough to have an extra stand, bottom board, and box available – capture, and add to the apiary. And that’s how most of the management goes in the Spring. And then comes the post nectar flow Summer, Fall, and Winter management. But can I break my addiction to adding? Can I be flexible enough to read the bees and the situation? The queen will slow her production down as nectar wanes and more so when the days start getting shorter. Can I tap the brakes, slow down, make changes? Or will I be too reluctant to pull off that super that I worked so hard to build them up to needing. Or maybe they’ve swarmed and the hive is half empty now, yet I want to leave those boxes on in hopes they will build back up – and they very well might if I’m flexible in my management! Maybe a queen fails and it becomes noticeable at the hive entrance that activity has slowed. But it’s hot and I’d rather not look inside; say it isn’t so because I’d really rather not track down a new queen. Or I have two hives that are in steep decline, should I combine them with stronger hives? I’m torn. After all, I have a plan as to how many hives I need to complete the mental picture I have of my hives sitting on their designated hive stands in my well designed apiary. I want “x” number of hives not “x-1” hives. And so, I return to the topic of flexibility. Can I be flexible enough to respond appropriately during these post nectar flow months? Oh, it’s difficult. But if I don’t employ the same discipline of flexibility in removing unpopulated boxes, combining weak hives, or replacing a failing queen what penalty is paid? Unlike the threat of swarms in the spring, the lack of flexibility now is paid for with increased pests, hive failures, and loss of valued comb. Hives no longer able to cover comb with bees allow Small Hive Beetles to go unchecked and run amuck in nectar. Worse still is the bane of Wax Moths that move in on weakened hives and steal your most precious resource – your hard earned comb. Weak and declining hives need to be combined with strong hives. But can I be mentally flexible enough to do what needs to be done and then look at that empty spot on the hive stand? Flexibility is responding appropriately now and telling myself that a split may be possible later in the year or at least next Spring. It’s all flexibility. I’ll read the bees as best I can, make adjustments, and go with the flow each and every time I visit the apiary or open a hive. Some days it’s like a gentle dance, other days it’s a roller coaster with ups and downs, round and rounds, bright lights and dark tunnels. When I pause afterwards I don’t say I enjoyed the ups but not the downs or the round and rounds. No, I say, “I enjoyed the ride.” Be flexible and enjoy the ride. The (BEE) Bucket Tool Jockey – about $5 at most home hardware stores. Everyone has a different preferred methods and tools to get ‘er done. That’s fine. What are some items you would recommend every new beekeeper place in their tool buckets, boxes, bags, etc.? Common sense approach to pollinator ecosystems. This highlights a common misinterpretation of what ecosystem services is all about. Services are delivered by interactions between species (including Homo sapiens) and their environments at multiple scales, not individual organisms or natural ecosystems. With this blog post I’d like to invite all of the followers and visitors of Beekeeping365 to post a response below announcing their blog and inviting others to come visit. I think most of my followers are beekeepers but beekeeper or not don’t let that stand in your way. It’s time to Bee Proud and tell others a little about your self and invite others to subscribe to your blog, Facebook page, or Twitter account. Don’t bee shy! Tell us what you’re doing, what you hope to accomplish, and invite us all to become regular visitors at your place!